Life is too short to not express the innate creativity inside of you. 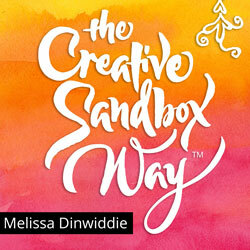 Host Melissa Dinwiddie features individuals and organizations who are approaching life and work creatively, playfully, and innovatively — making a difference, or living life “in full color”— in other words, living the principles of her book The Creative Sandbox Way™. 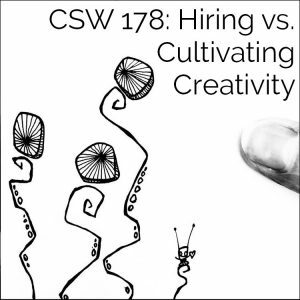 Along the way, and in between interview episodes, Melissa shares practical tips on creativity, productivity, innovation, and leadership. 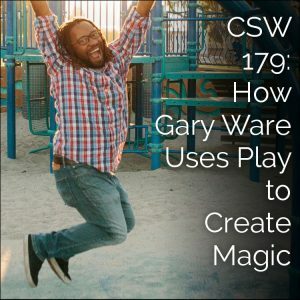 Sign up to get new episodes delivered straight to your inbox once a week, and I’ll also send you the first 50 pages of my book, The Creative Sandbox Way: Your Path to a Full-Color Life. In the wee hours of Monday morning (my birthday! ), I got back from a two-week trip. There are so many amazing things to share with you about this trip. I started my journey in Whistler, British Columbia, Canada, at the LEGO® SERIOUS PLAY® UnConference, where I was completely blown away when my Master Trainer presented me with a surprise award — the Facilitator Development Award — on the first day. 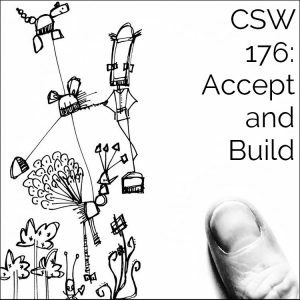 The recording was live when Jeff Harry and logged into the Zoom room, long before our “official interview” started, but the conversation for the first fifteen minutes was so interesting that I decided to keep it in. 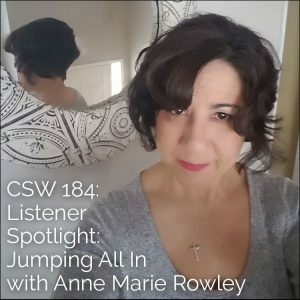 Be prepared to really feel like a fly on the wall of my studio in this one! Jeff believes that there’s nothing quite like watching a Senior Executive screaming with delight while skipping after a tiny LEGO® car. As the VP of Fun at Play-Well TEKnologies, he and his team show kids and adults how to tap into their true selves — feel their happiest and most fulfilled — all by playing with tiny LEGO® pieces. 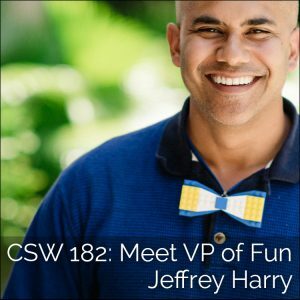 Jeff has worked with Google, Microsoft, Southwest Airlines, Adobe, the NFL, Amazon, and Facebook, helping their staff to infuse more play into the day-to-day. It turns out that giving people permission to be really silly helps them be more productive, learn faster and love their work. 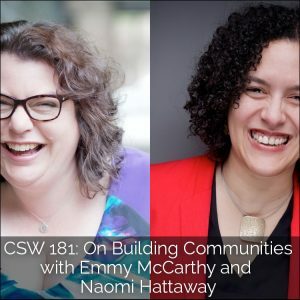 Emmy McCarthy has been building communities across Europe since Y2K. Before we liked each other on Facebook, before we became a number on someone’s mailing list, Emmy was helping humans connect to humans. She sees patterns where others see chaos. 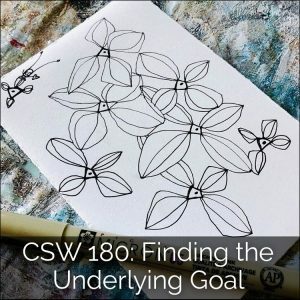 She uses those patterns to connect the dots and develop strengths-based solutions that grow communities and help small businesses thrive. On Sunday I led my second ever Creative Sandbox Playday. Three people were in attendance. Two of whom were me and my husband. The first Creative Sandbox Playday had eight people, so only three was something of a let-down, though there were supposed to be four — one attendee got sick and wasn’t able to be there. And a few others would have been there, but had scheduling conflicts. This kind of thing is a ripe opportunity for gremlins to rush in and tell me what a loser I am. 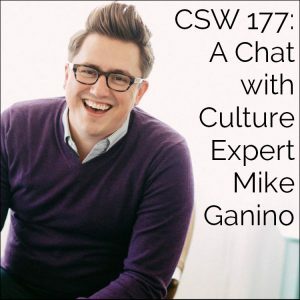 Mike Ganino is a culture + storytelling expert who helps executives, teams, and thought leaders communicate, connect, and engage. He is the author of Company Culture for Dummies and has been named a Top 30 Culture Speaker by Global Guru. Organizations love Mike’s high energy, high engaging workshops and keynotes that fire them up to rewrite the stories happening in their culture. They leave with real-life strategies they can begin implementing immediately for improved culture that drives employee and customer experience. I feel like I’ve been away for a solid month. And that’s not far from reality, because I was in Paris and Basel for 2 1/2 weeks, and then I was home for a week recovering from jet lag and preparing for my Creative Sandbox Retreat, and then I was away again at my Creative Sandbox Retreat. And now, as I’m recording this, it is exactly one month from the day we landed in Paris! Anyway, Paris and Basel were amazing. Best vacation we’ve ever had. Even though, I spent the entire time, from the fourth day onwards, on crutches! 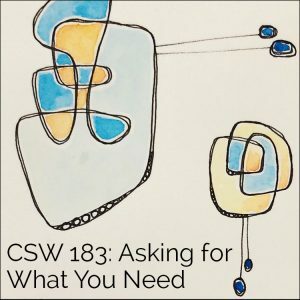 Listen to more episodes on the main podcast page here.